Young professor Jonah Baum teaches transcendental poetry and Gothic literature at a small Vermont college. But nothing in his profession could prepare him for the November 1987 afternoon when, faced with an empty home and missing wife and daughter, he’d step into a horror narrative of his own. With plenty of reason, and Jonah’s own doubts and confusion buttressing their assumptions, the police almost immediately began grilling him as the possible reason his family is missing. Did he chase them away? Or did he do something horrible to them? His alcohol-soggy mind can’t be fully certain of what’s going on and what he’s done. Desperate for reassurance, and of course for his family, Jonah calls his best friend Maurice Welch, a local sheriff, for help finding Rebecca and Sally. To his shock, Maurice sees him as a possible suspect, keeps grilling him, pushing at details that Jonah’s twisted a bit to not look like what he really is—a man who’s afraid of his own incapacity, afraid of being left, afraid of any moment without the cushion of a drink and a white lie. ‘And you just decided to take it up again on a whim?’ the detective said. ‘I don’t do much on whims,’ Jonah said. The detective scribbled a note. ‘And the head wound?’ He tapped his pen against his own forehead. All the small things of life in an imperfect marriage, a restless career, line up to condemn Jonah. Maurice is unable to help—he’s there as the law more than as a best friend, it seems. The real truth of what’s happened to Rebecca and Sally won’t be simple to find. What Remains of Her jumps forward into the adult life of little Sally’s used-to-be best friend, Lucinda Welch, the sheriff’s daughter. The small girls hadn’t understood much about their often scary world at the time of Sally’s disappearance, and Lucinda’s carrying a haunted burden of knowledge she couldn’t understand as a child, but recognized as full of threat. 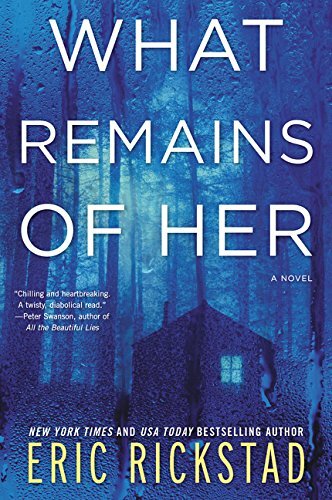 Despite Rickstad’s reliance on ghostly tremors of unspoken, unrecognized evidence, this crime novel’s shattering conclusion arrives relentlessly and depends squarely on the reality of the long-lived circle of friends. Tightly plotted, jammed with frightening scenes of threat and loss, the book may haunt readers especially with the possibilities that what happens here might transfer to real life. Which is, of course, the whole point of Gothic horror, embedded in crime fiction: to remind us of the fear and evil we half are drawn toward, half turn away from. Rickstad’s balance of this dark side with the counterpoint of courage and determination brought by now-adult Lucinda declares that truth may emerge, justice may be measured out. Maybe. Even this slim chance of righting the balance makes What Remains of Her a fiercely good read. Add it to the shelf of noir, along with Karin Fossum’s Scandinavian crime fiction, Stuart Neville’s violence-haunted Irish families, and Karin Slaughter’s twists on law enforcement and pursuit. As always, for Rickstad’s Vermont books, don’t count on the geography matching the real Green Mountain state. Thank goodness, the crime’s won’t match, either—at least, not for today.